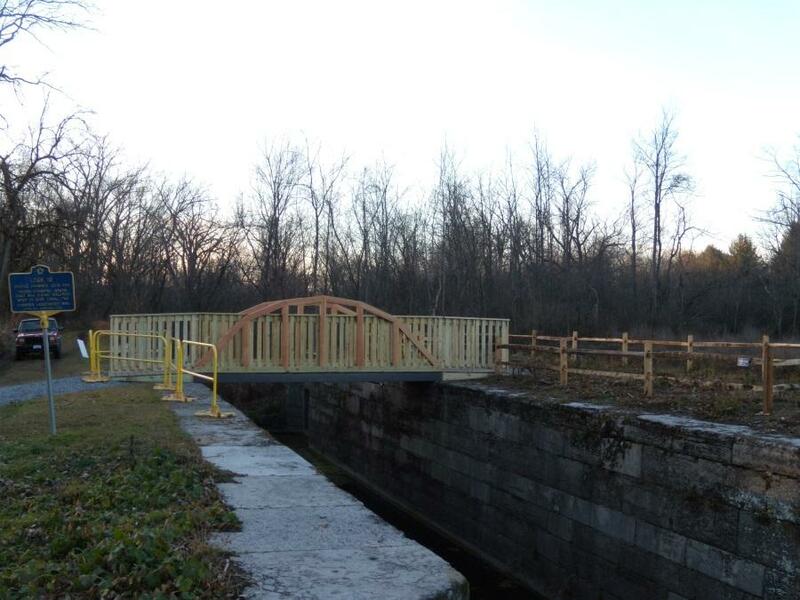 The president and CEO of the Chamber of Southern Saratoga County joined with representatives of a variety of public and private entities April 29 to open a footbridge over the Erie Canal’s historic Lock 19. The wooden and steel span allows visitors access to the middle section of the canal’s 1842 historic double lock. More than a dozen private businesses partnered with the Chamber, the town and the Shenendehowa Central School District on the footbridge project. The site, which is in the hamlet of Vischer Ferry, is accessed from Ferry Park, at the end of Ferry Drive. The idea for the project began with Chamber President Pete Bardunias. In the spring of 2012 he posed the project as a partnership between public and private entities as a way of putting the old lock site back into passive recreational use. The idea expanded from simply clearing brush and debris away to giving private business mentoring to 80 Shen students. In addition to helping clear the brush, the students formed teams that were mentored by volunteer engineers to compete on a bridge design and its marketing campaign. The final design for the footbridge was chosen last June. More than 1,700 volunteer hours and tens of thousands of dollars of donated materials and labor went into the construction, which was completed in December. The footbridge project will serve as a template for several more partnership projects on the Chamber’s agenda. On Monday, representatives from the businesses and the public sector organizations joined Bardunias, Clifton Park Town Supervisor Philip Barrett, Shen Superintendent L. Oliver Robinson and New York State Canal Corporation Director Brian Stratton to officially open the facility for public use. A new 2.3-mile section of the county’s Helderberg Hudson Rail Trail, which follows the path of the old Delaware & Hudson Railroad for about nine miles between Albany and Voorheesville, could be open this summer, officials said Friday. The wild stretch, which connects Voorheesville and Upper Font Grove Road in the town of New Scotland, will be the second section of the trail to open. A 1.3-mile stretch opened last May in Delmar. County and local officials joined the Mohawk Hudson Land Conservancy on Friday to sign a licensing agreement that clears the way for the new section to be made ready for the public, possibly as soon as the end of he summer, Albany County Executive Dan McCoy said. 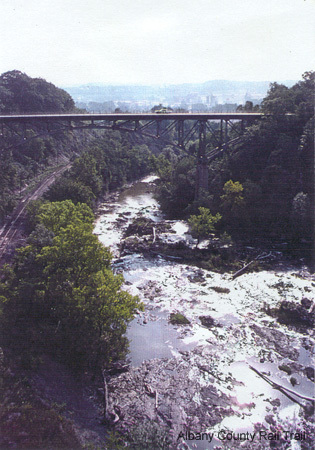 The idea for the trail dates to the mid-1990s, when the Canadian Pacific Railway, which acquired D & H in 1991, floated the idea of abandoning a 23-mile stretch of railway between the city of Albany and village of Delanson in Schenectady County. That plan was eventually withdrawn, but it planted the seed for a smaller venture that began in 2003, when Canadian Pacific sought to abandon a shorter stretch of the same rail line, this time between the city and Voorheesville. The county bought the land — a total of about 117 acres in Albany, Bethlehem and New Scotland — for $700,000, half of which came from a grant from the state Office of Parks Recreation and Historic Preservation that was matched by the Scenic Hudson Land Trust, a nonprofit that works for the preservation of land in the Hudson Valley. Parks and Trails New York, another nonprofit, has also advocated for developing the trail since the idea’s inception. Waylaid by the recession and the complicated inter-municipal agreements needed to resolve liability and other issues, progress slowed until the opening of the first section last year. “When government works together, people work together, things like this happen,” said Frank Commisso, majority leader of the County Legislature. The county initially envisioned the improvements would cost $7.8 million, including paving the trail with a hard surface, but cut its investment to zero amid its financial crunch. As part of Friday’s agreement, signed in sandy section of trail off of Upper Font Grove Road, the Mohawk Hudson Land Conservancy agreed to do most upkeep and trail maintenance — an effort that will begin Saturday as volunteers from Friends of the Rail Trail start clearing the path. The full length of the section is about 2.6 miles, but a small stretch — 0.3 miles on the Voorheesville end — will remain off-limits during engineering work and upgrades on two bridges that span Vly Creek and Route 155, officials said. That work, however, will proceed without the county’s financial aid, with the conservancy, village and town on the hook to find the money for the repairs, county spokesman Mary Rozak said. The next section of trail targeted for opening will be east of Delmar through the Normanskill Gorge. The trail will eventually end just east of South Pearl Street in Albany near the Bethlehem town line. The Erie Canalway National Heritage Corridor Commission has released its free, 2012 Erie Canalway Map & Guide to introduce residents and visitors to the many things to see and do in the Erie Canalway National Heritage Corridor. People can obtain a copy at visitor centers, libraries, cultural heritage sites, and canal locks all along the New York State Canal System. The guide is also available for download online. “Whether you like boating, cycling, history, nature, or simply spending time with friends and relatives, you’ll find things to do and places to discover all summer long,” said Erie Canalway Director Beth Sciumeca. The eight page newspaper-style guide includes a map of the National Heritage Corridor, as well as a list of canal-related cultural heritage sites, boat rental and tour companies, places to cycle on the Erie Canalway Trail, and more. Funding support for the guide was provided by the New York State Canal Corporation and Brookfield Renewable Energy Group. The guide reinforces Brookfield’s message regarding the importance of safety on the waterway. The map and guide, along with the website , are among the efforts by the heritage corridor commission to increase awareness about the waterway, trail, and national significance of the Erie Canal.